The word EVENT MANAGEMENT has become so common in the corporate world of culture. Event management is completely an art where you need to manage different type of people, organize the program in time which is the most important in event management and organizing accordingly to type of program like creating an environment ,booking a hall which is suitable for the program and so on will all make your event successful. 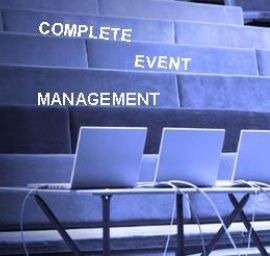 The corporate world of people are approaching event managers for making their event successful it could be an education seminar or a birthday party or any entertainment event so any every field there is a requirement for event managers, by this we can know that career in Event management has a bright future. The more you are expertise in this field the more you can earn name and money in this area. Now a day, event management has become a professional Industry and has become as one of the top most career in India. Event management is playing a very important role in promoting various programs so it became a major marketing strategy in the business world as they are getting more publicity by conducting events. So whether it is a birthday parties, product promotion, fund raising program, product promotion whatever it is now event management is playing a major role. If you have good communication skills, leadership skills, building up of social network then you can choose for Event management. You must have soft skills as you need to manage everything on time. One need to be careful in spending money in appropriate manner and these all skills make an event successful. Generally if you join as an Event manager then you may get a starting salary of 15-20 thousand and likely with the more the experience you gain the more you earn and likely if you organize the events individually then you can easily earn 2-3 lakhs in this field. But you need to have risk management skills then only one can be successful. Event management is nothing but publicity or creating a brand for a product or for a firm. But now marriages have also come under event management and career opportunities in this field has increased. Event management can be categorized as social events, education events, Corporate Events, Exhibitions and fairs, Marketing promotions and Entertainment events. Social Events: conduction of Marriages, birthday parties, charity functions etc., comes under social events. Educational Events: organizing the fairs on time by providing all the facilities on time is very important in this career. Likely, Educational fairs, conducting of seminars, conducting farewell, and fresher, annual day functions comes under educational events. Corporate Events: Event management has become a part of Corporate Industry if you want to grow in this field you need to have a good social circle, need to handle all the responsibilities carefully as any event conducted by the corporate world brings a brand image so you need to be careful. Likely, conducting of Meetings, seminars, Training sessions etc., will come under this type of events. Exhibitions and fairs: Export, property, Jewelers type of exhibitions come under this. Entertainment Events: New Year parties, Celebrity Nights, conduction musical nights, dance parties etc., will come under this type of events. Marketing promotions: Ad campaigning, product launching will come under marketing promotion of a product or a firm. Courses offered: PG Diploma in Corporate Communication, Public relations and Event management. Course offered: PG diploma in Event management and Public relations. Course offered: PG Diploma in Event management and Corporate Communication. Course offered: PG Diploma /Diploma in Event management and Public Relations. Course offered: PG diploma in Event management. 7. Amity Institute of Event Management (Amity University) – New Delhi. So, this is the information regarding the career in Event management if you want to pursue career in this field one thing that need to be remembered is the more the experience you gain the more you can earn and learn in this field . I am current doing job in event management company ,and wanted to do work with good brand name company,if their is any vacancy for the same related job then contact me.